There is a lot of material here. It takes time to digest it. For me, it took more than 16 weeks for the deeper understandings to emerge. So I recommend printing out this article and reading a section or two a week. Session #1: Lift the Eyes! Orbital Lift — for All Three of the Major Yoga Paths! Week #4: Orbital Lift to the Rescue! Summary: Orbital Lift – It’s not about the focus, but the lift! Of course, all of the instructors kept using the outdated, outmoded, and incredibly misleading terminology. Being a writer by trade and a usability engineer at heart, I immediately re-labeled the technique so it had a descriptive name. For the rest of the course, whenever the instructors said “gaze at the third eye”, I immediately translated what they said in my head. And following those directions produced fantastic results. The key to understanding the technique is in the name: Orbital as in “eye”, and Lift as in “lift upward”. It’s not about looking anywhere in particular, or focusing on anything in particular. It is a simple, internal muscular action where you lift your eyes upward. You can be looking straight ahead or down. You can be focusing on the screen in front of you, a car down the road, or on a distant mountain. It makes no difference. What makes a difference is lifting your eyes upward. As Kriyananda notes in his book: “as though lifting them into their upper sockets”. But I would go one further: It is exactly the action of lifting your eyes into their upper sockets. The remainder of this post extracts material from a series of write ups on the 16 sessions in the Raja Yoga program. It also adds a few things. But in the main it describes the discoveries that came about as a result of using this mind-bending, heart-opening, joy-inducing technique. Continuing insights in the 3rd week…. When you sit for meditation, look up toward the point between the eyebrows. I don’t mean to cross your eyes, but only to direct your gaze upwards, focusing them at a point no closer than your thumb when held at arm’s length from your body. You might think of the eyes as being situated only in the upper part of their sockets. That last part is particularly instructive: “Think of the eyes as being situated only in the upper part of their sockets.” That is huge! Because that is the Orbital Lift. That’s something I missed, the first 10 times I read it, but it is completely and utterly descriptive. Note too, that when your “eyes are in the upper part of their sockets”, it doesn’t matter which way they’re pointed, or how far the cornea is tensed to establish the point of focus. What matters is that the eyes are in the upper part of their sockets! And that is the Orbital Lift. So instructions to “focus at the point between the eyebrows” are, to my mind, sadly misleading! But here’s the thing: As I wrote after the 4th Raja Yoga sequence, the Orbital Lift Comes to the Rescue when you’re frustrated or angry. And as I’ve written here, eventually it leads to real liberation. 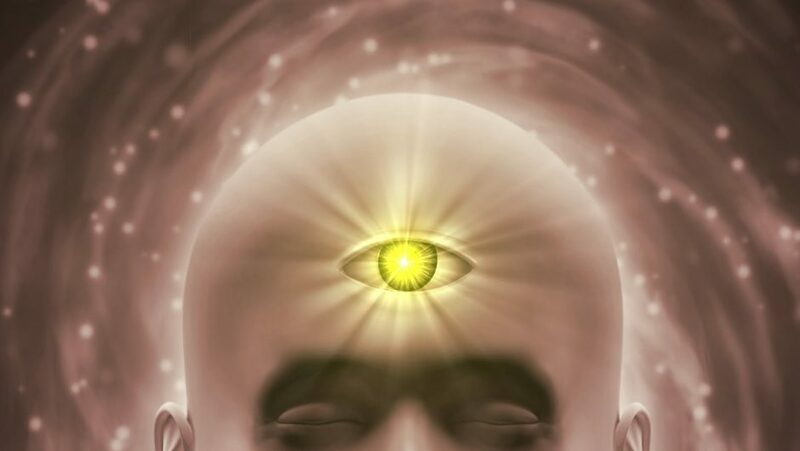 The idea of “gazing at the third eye” is an ancient tradition. But as commonly instructed, it makes you go cross-eyed! Naturally, no one does it. Even the somewhat better instruction, “focus at the point between the eyebrows”, is misleading enough for most people to miss the point entirely. The very first class gave me one great tip: Lift your eyes as though looking at the top of a faraway mountain. Interestingly, that is the same angle you would use to gaze at the top of a distant mountain! The important point is that it is not about where you focus your eyes, or even what direction they’re pointed. The more important part is lifting them. Now, granted, that three-foot focus is pretty powerful. It quite nicely induces a focus on “spiritual connection”. There are physiological reasons for that, I think. But the fact is that you can’t very well go about your day looking at that spot! You’d run into a lot of doors. You can, however, lift your eyes—throughout the day. By “lifting”, I mean a slight contraction of the muscles above the eyes, as though you were pulling them upward. That technique is something I learned the very first day, and to say it is powerful is an understatement. It’s an antidote for depression, frustration, and every negative situation we encounter in our lives. It takes us up and out of ourselves and our circumstances, and moves us in the direction of divinity. And it’s something you can do all day long, regardless of what you’re engaged in. However, it is important to note that the technique I discovered was an interpolation from things taught in the class, rather than a direct application of what I was taught. My suggestion then, is that the whole idea of “gazing at the 3rd eye” (or gazing anywhere for that matter), should be augmented with the idea of “lifting the eyes”, without changing their focus, or even the direction they are looking! at a point no closer than your thumb when held at arm’s length from your body. something I missed, the first 10 times I read it, but it is utterly descriptive. point of focus. What matters is that the eyes are in the upper part of their sockets! That is the most important part of the instruction, and that is the Orbital Lift. As you meditate, focus every perception at the point between the eyebrows. He is in good company when he does that of course. The technique has been taught in that manner for literally thousands of years. And for that same period of time, I would argue, the majority of humanity has been misled! This section contains an excerpt from my upcoming book. It’s something else I picked up from the Raja Yoga program, so I’m including it here. When things really get you down, this is your “go to” move. It all starts with what I learned in Session #16. This one came to me after the night of Raja Yoga practices where we focused on broadcasting healing energy from the 3rd eye. It is a principle of Raja Yoga that healing energy is received through the medulla. If that sounds familiar, it’s because that area is also known as the “Mouth of God”—the place where God’s energy enters the body. So when you are doing a healing practice, you are actually inviting/directing/calling for the energy of god, the universe, and all-that-is to send that much greater energy, and to do the healing. Driving down the road one day, I saw a police car pulled over next to an accident. There wasn’t anything I could do physically, but the one thing I could do was to send healing energy to the officer and to everyone involved. From then on, it became my practice to broadcast healing energy to panhandlers and anyone else who looked like they might need some! I have to stop here. The rest of the section in the book gives a lot of details, and is much too long to include. But at this point you have learned all of the basics. It’s just a matter of putting them all together! Clearly, the Orbital Lift was a gold mine — or the “motherlode”, more like. It was a blessing, pure and simple — one that I’ve used every day since to stay positive regardless of circumstances, and to experience even deeper joy when circumstances are good. To say I got a lot out of the Raja Yoga program would therefore be a massive understatement. And the Orbital Lift was only one of the discoveries to come out of it. But one reason it was so beneficial lay in the many years I spent training with a martial arts master in the south San Francisco Bay, and my previous experience with Ipsalu Tantra Yoga . Those practices prepared the ground, in a big way. But everyone I’ve taught the Orbital Lift to has found it to be helpful, so it’s not just a matter of background. Still, the background made it possible for me to recognize the technique for what it was, and experience its massive value. In fact, the combination of the Tantra Yoga practices I learned through Ipsalu and the Orbital Lift and other techniques learned in Ananda‘s Raja Yoga program were so powerful that my meditation-and-asana practice took off in totally unexpected ways. I “downloaded” so many insights and ___ from the energy of the cosmos that I would up writing a book on the subject, and developed a meditation bench for the purpose! Both of those projects are on their way to fruition, but the benefit I really want to share is that I got to where I was spending anywhere from an hour to an hour and a half in my combination practice. I found it so enjoyable that there were times I would rather do my practice than watch TV! I found myself doing it twice a day — not because someone said I should, but because when I didn’t, I missed it! Twenty-fours hours was just too long to go before taking another hit from the happiness pipe. Since then, I’ve backed off a bit, but I still meditate longer and more frequently than I did before. you get the most out of that class, here is the list of Enhancements and Suggestions I wrote up.